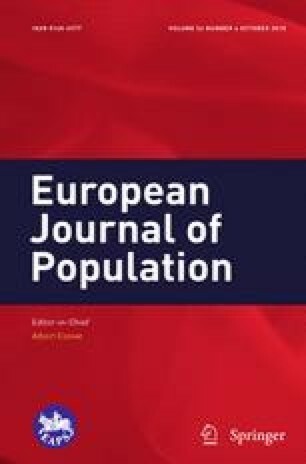 Studies on fertility among second-generation migrant women across Europe have mainly treated the second generation as a rather homogenous group, not linking and distinguishing fertility patterns by type of partner. This study investigates how and to what extent the origin and generation of the partner (endogamous or exogamous as well as diversity in endogamy) of Turkish and Moroccan second-generation women in Belgium is related to first-birth rates. We distinguish three types of partnerships: those in an endogamous union with a first-generation partner, those in an endogamous union with a second-generation partner, and those in an exogenous union where the partner is of native Belgian origin. We use linked Census-Register data for the period 2001–2006. Applying event history models, our findings reveal clear differences between the endogamous and exogamous unions with respect to the timing of first births. Second-generation women of both origin groups have the lowest parenthood rates when the partner is of native Belgian origin. However, no variation is found within endogamous unions. For endogamous unions with a first-generation partner, the parenthood rates are approximately the same (and not higher, as was expected) compared to when the partner is also of second generation. The research leading to these results has received funding from the European Research Council under the European Union’s Seventh Framework Programme (FP/2007–2013) / ERC Grant Agreement No. 312290 for the GENDERBALL Project. In addition, the research was part of and supported by the European Research Council Starting Grant Project (No. 263829) “Families of migrant origin: A life course perspective”. Tables 4, 5 and 6.